While you were sitting in the park eating your Twisters this weekend, some of us were hard at work shopping the sweaty high street so you didn't have to get off your deck chair. That's right, this weekend I threw on my Supergas and hit up a relatively new high street store that is causing a buzz in the fashion industry right now, the questionably named '&OtherStories', sister to Scandi brands H&M and COS.
With a store on Regent Street and a simple-to-navigate online shop too, this is the ultimate go to for cool clothes, amazing shoes and leather accessories that look 50 times more expensive than they actually are. The jewellery and beauty selection isn't bad either. 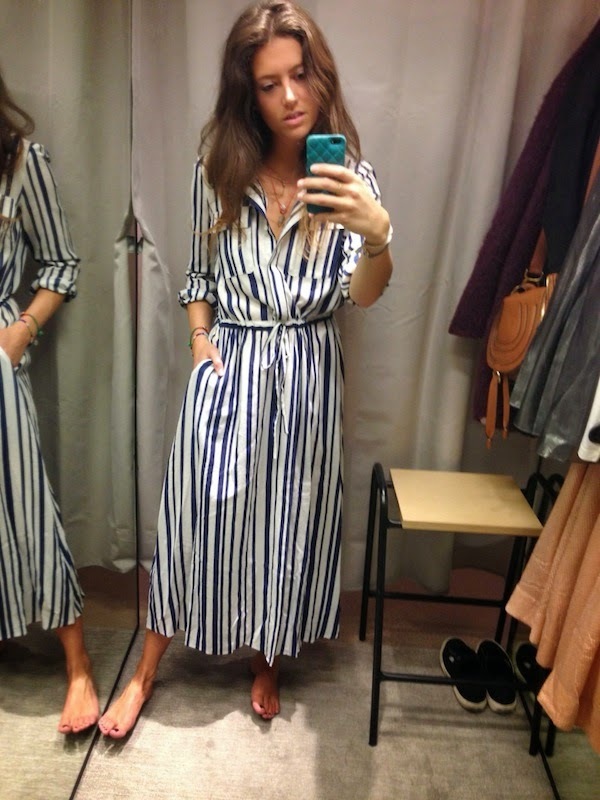 First up, the awkward-length-stripe-dress (£39, size 36). There is something really great about the skirt lengths in &OtherStories, they're often cut at an incredibly unsexy ankle height, yet they feel fresh and modern in spite, or possibly because of it. 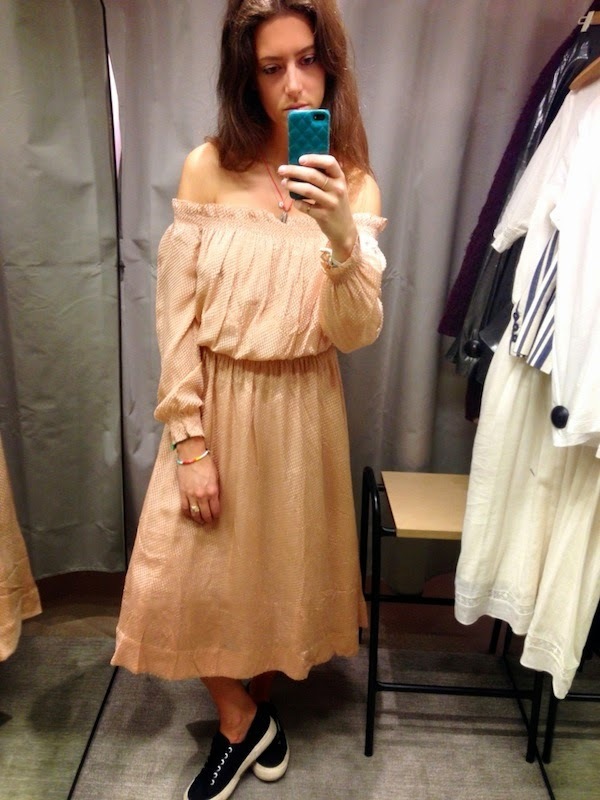 This dress would be just as good with leather sandals on holiday on a Greek island, as it would be for a day in the office in London. Next up this Lanvin-esq metallic pleated skirt (£65, size 36) which I had a blast trying on with its matching metallic top, energetically performing 'the robot', and then swiftly replacing it with this classic white tee (£12, size 36) before anyone saw me. The skirt would be perfect for a summer wedding if paired with a short and structured black top. This next look, I call my Amish-Aesthetic. 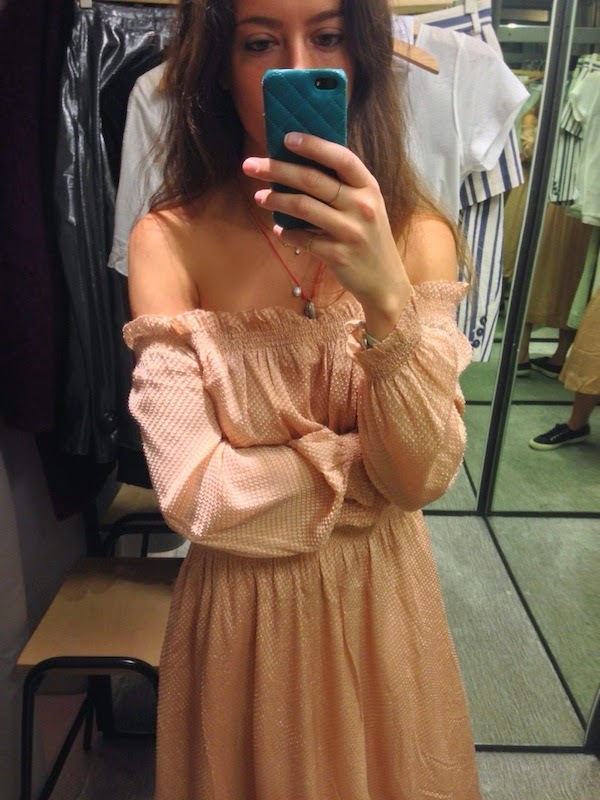 I'm having a love affair with off-the-shoulder this season, but not with sickly-salmon-pink and so I feel it my duty to tell you right here right now that this dress (£55, size 36) does come in black. It was, however, too dark to photograph - so for you dear reader I have braved the piscatorial pink. I've never had to wear a suit to work, but I imagine if I did, this would be the type of thing I'd rock up in, Supergas and all. Then I'd probably be sent home to change into something more appropriate. 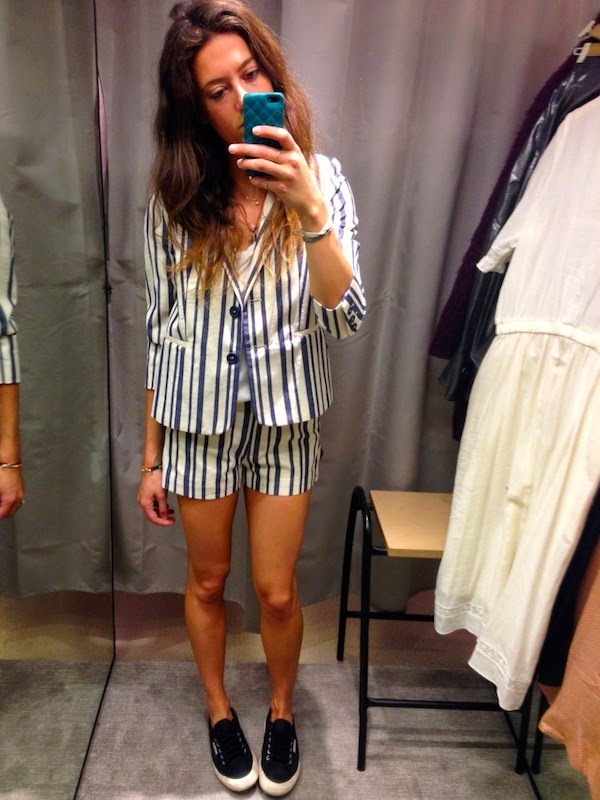 I love this stripey summer combo, perfect length shorts (£29, size 36) - short but not slutty - and the cute boxy jacket (£79, size 36) which would probably go with everything in your wardrobe. 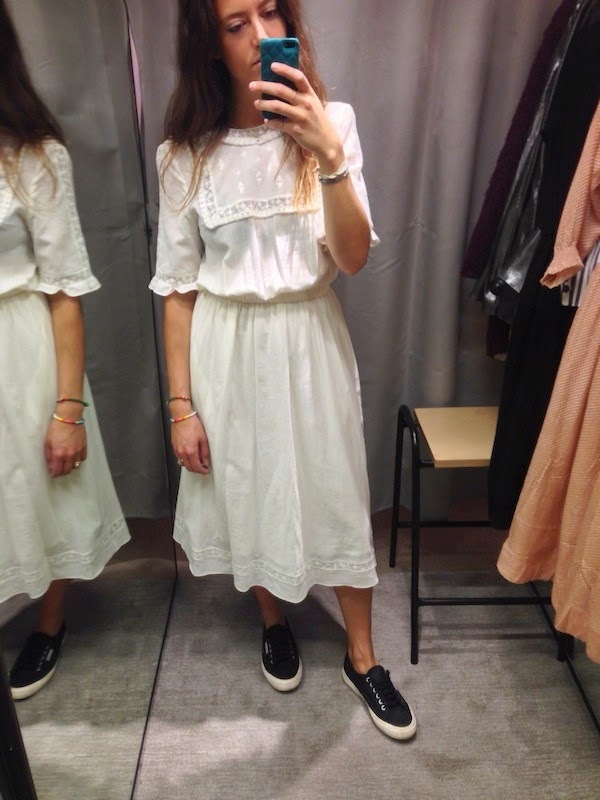 My final, angelic look, is this perfectly-puritan-peasant dress (£45, size 36). 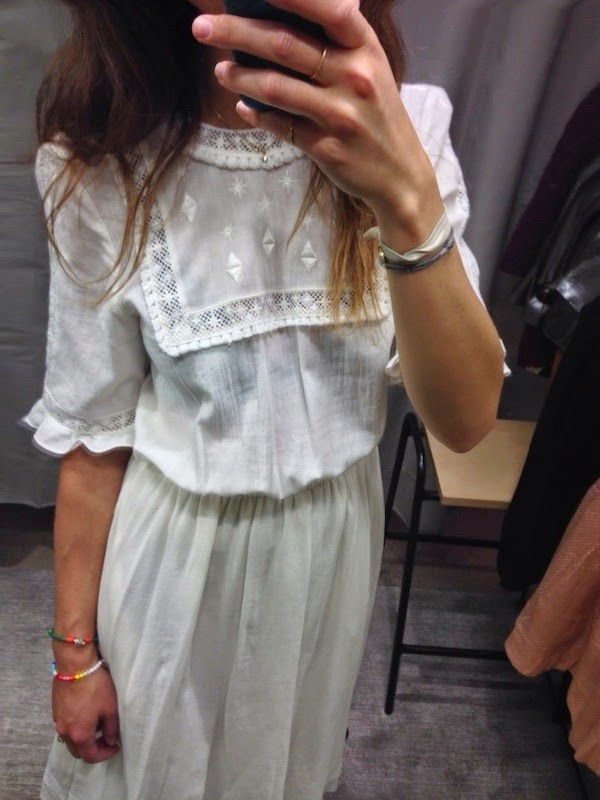 This soft brushed cotton dress is crying out for a clunky tan leather sandal and a trip home into my wardrobe. 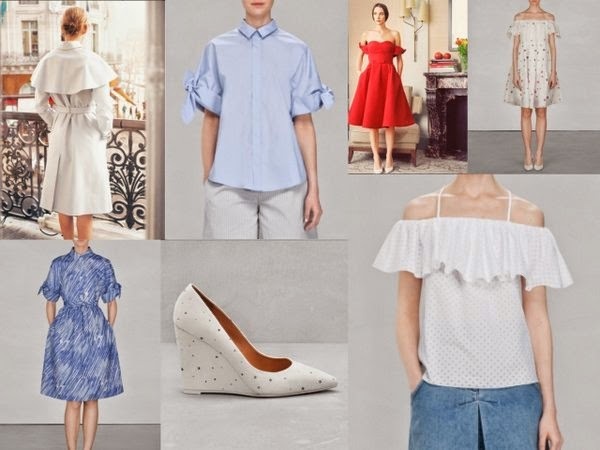 In other news, &OtherStories have currently released a collaboration with celebrated Russian fashion designer and beloved of Miroslava Duma et al - Vika Gazinskaya. 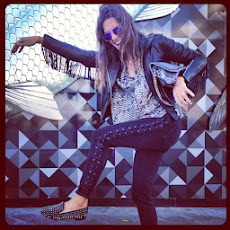 Her designs which sell for unpronounceable sums of money have been streamlined for &OtherStories and are dynamic, interesting and unique.